These are 24 simple words, but they offer an opportunity for profound self-examination. Are the words of our mouths pleasing to God? I can think of 4 ways of looking at that. 4. How we speak our words. We all know that sometimes our words themselves may be fine, but the tone we use conveys anything from disrespect to contempt. What about the meditation of our hearts? Here are 3 things to consider. 3. These are more examples of acceptable thoughts. In my NIV translation, Psalms records 12 times the word 'meditate' is used. The writers of the psalms meditate on God's unfailing love (Ps. 48:9), His works (77:12, 143:5 and 145:5), His precepts (119:15 and 119:78), His decrees (119:23 and 119:48), His wonders (119:27), His law (119:97), His statutes (119:99), His promises (119:148). This should be our prayer each day, and our guideline for whether we should be saying or even thinking any given thing. 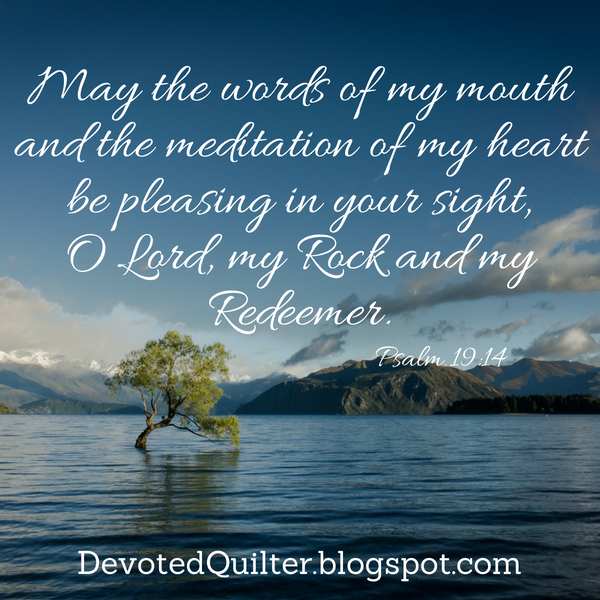 May the words of our mouths and the meditation of our hearts be pleasing to Him today. I made this scrap quilt last year to use it as our beach/picnic blanket. I can't tell you who designed it because I no longer have the pattern, but it was designed to be made with precuts. I used scraps from my stash instead, meaning I did a lot of cutting before I could sew anything. I wanted it to fold up small for when we're carrying it around, so I didn't use batting. I sewed the front and back together before quilting, which I rarely do. I always find that, no matter how carefully I pin, the layers shift and I end up with an uneven quilt. I've used this for a birthday party tablecloth too, and the kids always end up pointing out the different pictures in the fabrics while they're eating, which is fun to listen to. Here are a few of my favourite fabrics. This orange center seems to glow. The back is pieced from men's shirts I had lying around. The black one was slippery to work with...not sure what it was made of exactly, but it sure won't show grass stains! I hope you find time for a picnic or a beach day this week! I have been basting blue hexies like crazy so I could have as many as possible finished before we leave for Florida. Each little bundle holds 20, so I have now basted 375 blue hexies! Woo Hoo! That means I have more than half the blue ones I will need for my quilt (336 being the halfway point), and I have less than 300 left to go to reach the 672 total. And I won't be basting any more hexies for a while. This chick needs a change...time to actually sew some of these together. Just in case you're wondering, I don't actually think I will sew all of these while we're on vacation. I do plan to do other things, like look at the scenery as we drive, ride roller coasters, swim with sharks and shop (anyone know a good fabric store in the Orlando area?). However, I really don't want to run out of stitching before we get home, so I figured way over prepared would be better than under prepared. By the way, that beautiful wooden bowl holding the hexies...that's my Dad's handiwork. Today is Canada's 147th birthday. Thursday will be the United States' 237th birthday. We have such an overabundance of food and material goods in our countries that it's hard for many of us to even imagine what life is like in places where there is no food, no water, no medical facilities and no malls packed with toys, clothes and electronic gadgets. That's not to say life is easy for everyone. Even in prosperous North America there are too many families who struggle to meet their basic needs. But for most of us, we have enough and often more than enough. Before he died, Moses spoke to the Isrealites. They were near the Promised Land, a land they had been looking forward to for generations, a land promised to their ancestors Abraham, Isaac and Jacob. God called it "a good and spacious land, a land flowing with milk and honey." (Exodus 3:8). This is what Moses had to say to them. We don't set out to forget God. Instead it's a gradual turning away, forgetting a little more each day to rely on God. Forgetting to trust in Him - in His provision, His protection and His grace. How do we prevent this gradual forgetting of God? Moses gives us the answers in verses 10 and 11. First, in verse 10, "When you have eaten and are satisfied, praise the Lord your God for the good land he has given you." Praise God for every good thing he has given you. Thank Him daily, multiple times a day even. Thank Him for the big things, like health and family, but don't leave out the little things, like the birdsong you enjoy hearing or the smell of chocolate chip cookies fresh from the oven. A thankful heart will remember God. And in verse 11, "Be careful that you do not forget the Lord your God, failing to observe his commands, his laws and his decrees that I am giving you this day." In other words, pay attention to how you live. Don't get complacent and start slipping in your walk with God. Remember how He wants you to live and do your best to live that way. Of course, this comes back again to knowing God's commands. You can't live according to a standard you do not know. So crack open your Bible. Read it, study it and then apply it. This week, whether you are Canadian, American or something else entirely, remember God. Look around and marvel at the many good things around you. Praise God. Thank Him. Study His commands and put them into practice.